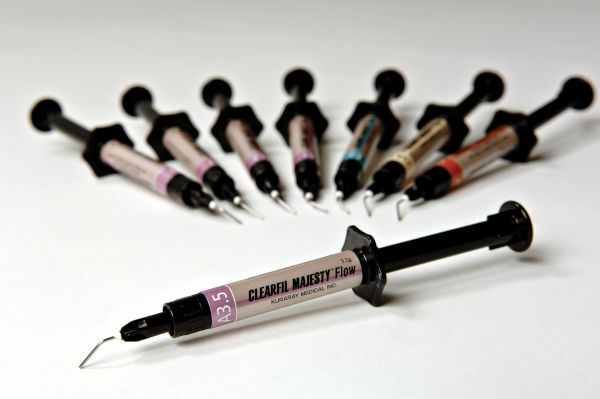 Clearfil Majesty Flow | Kuraray America Inc.
Clearfil Majesty Flow from Kuraray America, Inc. is a universal flowable, radiopaque restorative composite resin with the filler particles treated with a proprietary new surface coating technology used for anterior and posterior restorations. The resin matrix is reinforced with very high filler loading for good strength and wear resistance, even for posterior restorations. The low viscosity of this composite resin allows for good handling and easy placement. This versatile product exhibits high mechanical properties, high radiopacity for better radiographic detection, and very low polymerization shrinkage. It is delivered in a dispenser that provides bubble free and controllable dispensing as well as easy handling. This flowable is very easy to use, with great viscosity. It has minimal bubble formation. Easy-to-handle composite resin with highly rated polishibility and shade matching capabilities. Excellent product, good viscocity. Not runny like some other flowable comp. Highly recommend this product to anybody.